This article is about the number. For the year, see AD 10. For other uses of "ten", see Ten (disambiguation). For other uses of the ordinal 10th, see Tenth (disambiguation). 10 (ten) is an even natural number following 9 and preceding 11. Ten is the base of the decimal numeral system, by far the most common system of denoting numbers in both spoken and written language. The reason for the choice of ten is assumed[by whom?] to be that humans have ten fingers (digits). Ten is used as a theoretical highest number in topics that require a rating ("a mark out of ten"), by contrast having 0 or 1 as the lowest number, and 5 being average. The number of kingdoms in Five Dynasties and Ten Kingdoms period. 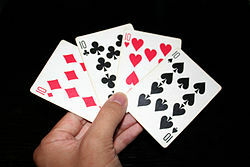 The number in tarot decks that corresponds to either Chance, Fortune, or the Wheel of Fortune, depending on the deck variant. Ten is a composite number with 4 divisors, its proper divisors being 1, 2 and 5. Ten is the smallest noncototient, a number that cannot be expressed as the difference between any integer and the total number of coprimes below it. Ten is the sum of the first three prime numbers, of the four first positive integers (1 + 2 + 3 + 4), of the square of the two first odd numbers and also of the first four factorials (0! + 1! + 2! + 3!). Ten is the eighth Perrin number, preceded in the sequence by 5, 5, 7. Ten factorial seconds is exactly equal to 6 weeks. According to a conjecture, ten is the average sum of the proper divisors of the natural numbers if the size of the numbers approaches infinity (sequence A297575 in the OEIS). The metric system is based on the number 10, so converting units is done by adding or removing zeros (e.g. 1 centimeter = 10 millimeters, 1 decimeter = 10 centimeters, 1 meter = 100 centimeters, 1 dekameter = 10 meters, 1 kilometer = 1,000 meters). Ten Plagues were inflicted on Egypt in Exodus 7-12. In Hinduism, Lord Vishnu appeared on the earth in 10 incarnations,popularly known as Dashaavathar. In Sikhism, there are ten human Gurus. "Ten lords a-leaping" is the gift on the tenth day of Christmas in the carol "The Twelve Days of Christmas". Decathlon is a combined event in athletics consisting of ten track and field events. In gridiron football, a team has a limited number of downs to advance the ball ten yards or more from where it was on its last first down; doing this is referred to as gaining another first down. In auto racing, driving a car at ten-tenths is driving as fast as possible, on the limit. In boxing, if the referee counts to 10 whether the boxer is unconscious or not, it will declare a winner by knockout. In men's field lacrosse, each team has 10 players on the field at any given time, except in penalty situations. In most rugby league competitions, the number 10 is worn by one of the two starting props. One exception to this rule is the Super League, which uses static squad numbering. ASCII and Unicode code point for line feed. In macOS, the F10 function key tiles all the windows of the current application and grays the windows of other applications. Series on ESPN and ESPN2 entitled 1st and 10 which launched on ESPN in October 2003 to 2008 and moved to ESPN2 since 2008. "Ten Chances" is one of the pricing games on The Price is Right. A Cartoon Network franchise Ben 10, which has a number on its title. ^ "Sloane's A005278 : Noncototients". The On-Line Encyclopedia of Integer Sequences. OEIS Foundation. Retrieved 2016-06-01. ^ "Sloane's A001107 : 10-gonal (or decagonal) numbers". The On-Line Encyclopedia of Integer Sequences. OEIS Foundation. Retrieved 2016-06-01. 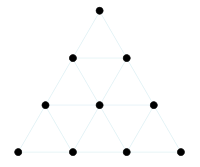 ^ "Sloane's A005448 : Centered triangular numbers". The On-Line Encyclopedia of Integer Sequences. OEIS Foundation. Retrieved 2016-06-01. ^ "Sloane's A000292 : Tetrahedral numbers". The On-Line Encyclopedia of Integer Sequences. OEIS Foundation. Retrieved 2016-06-01. ^ Khalil Garriot (21 June 2014). "Mystery solved: Why do the best soccer players wear No. 10?". Yahoo. Retrieved 19 May 2015.